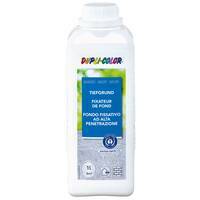 DUPLI-COLOR Substrate Stabilizer solvent-free is a colourless plaster hardening with deep impact. For sanding, chalking and porous grounds, such as old and new chalk, cement and gypsum plasters, concrete, brickwork, building material of gypsum, fibre cement. For priming of chalking dispersion paints. Object temperature min. 5°C. Do not expose to direct sun. The surface has to be dry, clean and fat-free. Before use, stir up well. Thinner: undiluted, if necessary with water.